There's a lot of talk these days about how parents reinforce mediocrity by rewarding children for doing nothing more than participating in a sporting event. The argument I hear is that children will develop unrealistic expectations about the level of effort required to achieve a real accomplishment. Personally, I have no problem giving a child a trophy for participation, especially in sports, where having an active kid is the real reward. I'm guessing that parents who reward simple participation in sports are likely more focused on practical things, like academics. I say this because, in every race I've run, only three people get to the podium and the rest (age group winners excluded) get (at best) finisher medals. Actually, most of the time your finisher medal is your race bib and that's why every race number that I've worn is tacked up on a bulletin board in my office. 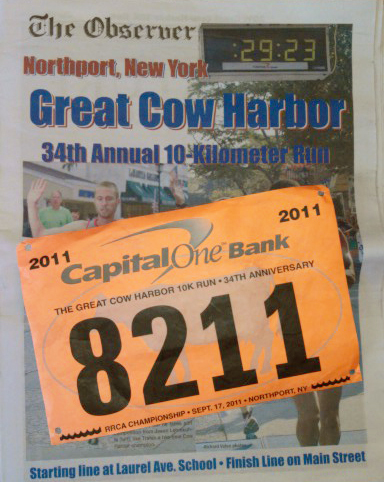 Saturday's Cow Harbor number makes it an even 20 and I'm inspired by each of them every day. With the exception of one race where I came in second in my division, I've been nothing more than a "finisher." Does it it bother me that this collection represents mere participation? Not at all. In racing, to participate is to accomplish. Just like 19 times before, I earned that trophy on Saturday. I read that article right after I'd written my post and thought it was interesting. I still maintain my position on this. Grit can come from the act of participation as much as it can from winning. I'm not saying that parents should applaud every strikeout like it's a home run, but they also shouldn't risk their child's self esteem by assigning too much importance to winning in sports.